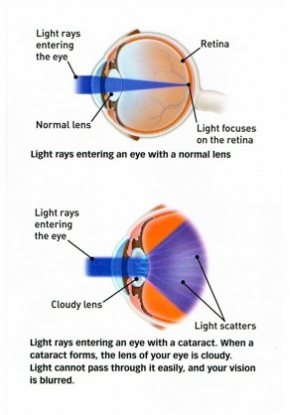 ​A cataract is a clouding of the eye’s naturally clear lens. The lens focuses light rays on the retina to produce a sharp image of what we see. When the lens becomes cloudy, light rays cannot pass through it easily, and vision is blurred. Surgery is the only way to remove a cataract. When you are no longer able to see well enough to do the things you like to do, cataract surgery should be considered. In cataract surgery, the cloudy lens is removed from the eye through a surgical incision. In most cases, the natural lens is replaced with a permanent intracocular lens (IOL) implant. A traditional monofocal lens is used to replace the cloudy lens with an implant that has one focus region. Monofocal lenses provide good distance vision, but you will continue to need reading glasses to see up close and intermediate distances. Multifocal IOLs will replace your cloudy lens in the same way that traditional monofocal lenses do. However, they provide you with improved near, intermediate and distance vision and reduce or eliminate your need for reading glasses. Due to the specialized nature of the Tecnis Multifocal lenses they do carry additional costs that are not covered by insurance. Talk to Dr. Jahnke or the surgical coordinator during your next visit to see if the Tecnis Multifocal lens and a life free from glasses is a possibility for you.